The final official Chief costume was purchased from Frank Fools Crow, a tradtional Lakota leader, in 1982 for $3000. Fools Crow was living in abject poverty at the time and spoke no English, although it was rumored that he understood it. 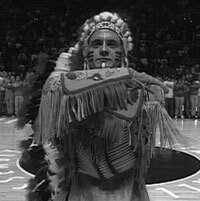 He was flown to Champaign, IL by the University of Illinois in 1983, to paricipate in a halftime ceremony where he presented the new costume to the University. 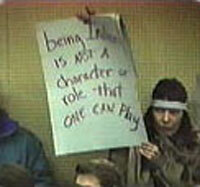 Chief Illiniwek supporters have long pointed to those actions as proof that Fools Crow endorsed the use of the mascot. However, others have claimed that he sold the regalia under the assumption that it would be displayed by the University in a museum-like setting as a historical artifact. Ultimately, there is no record that can verify Fools Crow's feelings about the mascot. However, one thing is certain: given that over the course of his lifetime he had witnessed the near total destruction of his culture and his people, Big Ten college football at a huge midwestern state university was probably not something Frank Fools Crow cared, or even knew much about. But Fools Crow's surviving relatives did, and because of their staunch opposition to the mascot, they asked the University to return the headdress and regalia that it had bought from Fools Crow. The Executive Committee of the Oglala Sioux Tribe then threw its support behind their effort, passing a resolution in 2007 that read, in part, the tribe "hereby demands the return of the regalia and the original eagle feathers to Mel Lone Kill on behalf of the decendants of Fools Crow." The University of Illinois Chancellor at the time, Richard Herman, subsequently agreed to comply with the request, and sometime in 2007 or 2008 the regalia and eagle feathers that had been purchased from Frank Fools Crow were returned to the Oglala Sioux.